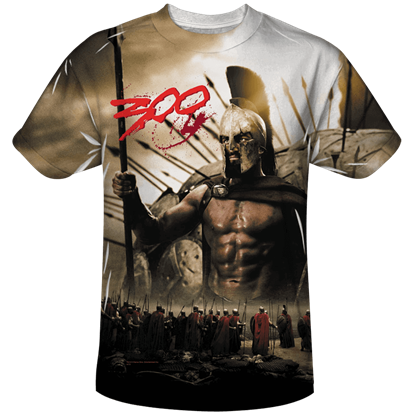 Shop here for our selection of Frank Millers movie 300 replicas. Many of these 300 replicas come with a Certificate of Authenticity, are officially licensed by Frank Miller, and are fully functional. We have the real steel high carbon steel Spartan sword, the huge Spartan Shield, Spartan greaves and Spartan bracers that are made of antique brass over steel. We carry the red Spartan cape worn by the Spartans in the movie and two styles of brooches to make it authentic looking. Finally we do have the famous Leonidas Helmet with a black plume as well as the Spartan helm the other warriors were wearing. We offer Spartan costumes, immortal costumes and Queen Gorgo costumes along with accessories to use for parties, Halloween, or any other event that you desire. Frank Millers 300, the movie is about as amazing a movie as you will ever see. Based on the Battle of Thermopylae, the movie follows the stylized historical account from Millers earlier graphic novel of the same name. In reality, several Greek city-states, including Athens and Sparta, banded together to resist the Persian empire from conquering Greece. The battle went badly for Greece, and only 300 Elite Spartan soldiers, led by their King Leonidas, stood against the might of the Persian empire. The strength of the Persians was reported at anywhere from 250,000 to one million. But by using the terrain to their advantage, the 300 Spartans held off the Persians for days.